Manager Owen Coyle insists he is not concerned about his own future as Bolton's slow start to the season continued at Birmingham on Tuesday. Relegated Wanderers have lost three of their first six Championship games. 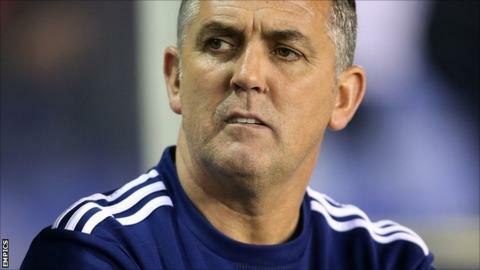 "As regards myself, I know what we can do and I know the players we have," Coyle told BBC Radio Manchester. "If ever there comes a time that somebody thinks that should be their decision, so be it. I've never worried about that in football." Coyle continued: "My concern is making sure the players are working their socks off for Bolton Wanderers, which they've done and they've come off the wrong side of some terrible decisions." Bolton were left to rue a controversial penalty call from referee Carl Boyeson that cost them a point at St Andrew's. Marcos Alonso was adjudged to have fouled Birmingham striker Marlon King, who converted the resulting spot-kick to give Blues a 2-1 victory. "It's clearly not a penalty," said Coyle. "I wish I could referee games because there would be a few different decisions given. "The referee came across three times in the second half and apologised to me, saying he'd got something wrong. Of course it's hard to take but I don't want people thinking we're hiding behind excuses." Bolton have lost all four of their away fixtures so far this season - three of them in the league and the other at Crawley in the Capital One Cup.